For four years, Nigerian civil servant Sunday Fanoiki lived alone in a deplorable, one-bedroom apartment without a kitchen, without a private bathroom and without his wife and three children. Today, he is the proud owner of a new, Fuller Center home. Transfered in 2003 from Lagos to the capital city, Abuja, Sunday found the expenses crushing, and could not afford to bring his family. His living conditions were so poor that he did not allow them to visit, but instead spent time with them at their former home in Lagos whenever he was able. When he could no longer maintain two homes, Sunday brought his family to Abuja and the five lived in a one-bedroom shack. His wife cooked outside. His children had to share the toilet with eight other families. Early in 2008, a colleague told Sunday about The Fuller Center for Housing. He was initially excited, but skepticism took over. No one believed that a decent house could be sold for such a low cost, and with no interest. His friends discouraged him from applying. But Sunday’s living situation was rapidly deteriorating and eventually became unbearable. Desperate to help his family, he took a chance and visited the Fuller Center’s office, where he was encouraged by what the staff told him and the homes already built by The Fuller Center. He applied for a house. 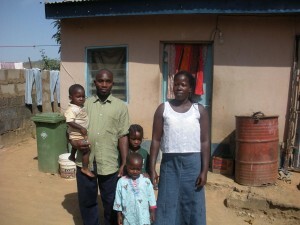 Now, thanks to The Fuller Center, one of Nigeria’s civil servants and his family have adequate living conditions. Sunday’s wife, Bunmi, is grateful that her children don’t have to share a toilet with strangers, and that she has a real kitchen and doesn’t have to worry about dirt getting into the food. 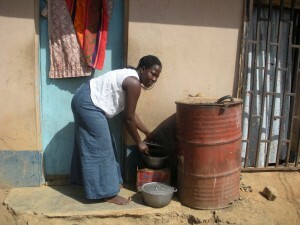 Sam Odia, the Fuller Center’s program director in Nigera, shared this story. The Fuller Center extends its deepest gratitude to everyone who made Sunday’s home possible. However, there are still countless, hardworking families like this in Nigeria who need our help. Please consider making a donation to our program in Nigeria. Read more about it on their partner page.